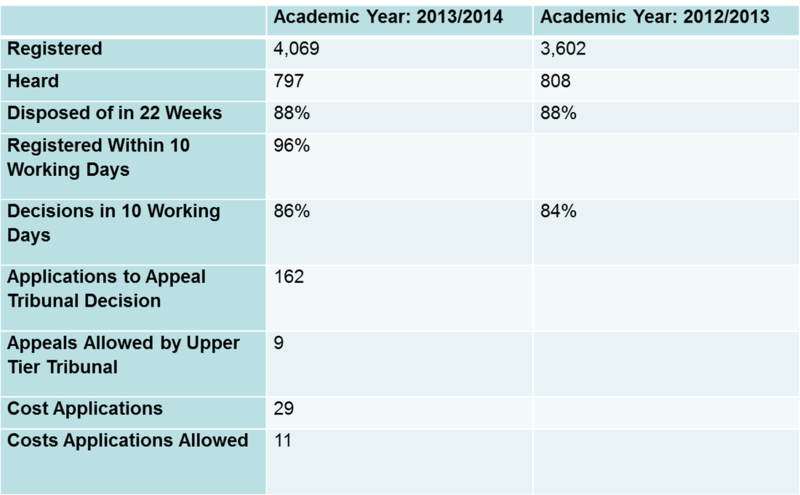 In 2013-2014 the number of Tribunal appeals registered exceeded 4,000 for the first time ever. The exact figure was 4,069 – which is 13% higher than the previous year. Of these 4069, just 21% (or 797) were actually decided by the Tribunal which is 3% lower than the previous year. Of the appeals heard by the Tribunal, 83 % were decided in favour of the appellant. The most common types of appeal were against refusals to assess (at 40%) and against the contents of the Statement in Parts 2, 3 and 4 (at 23%). You can find the full picture by numbers by reading the ‘Tribunals and Gender Recognition Certificate Statistics Quarterly’ for December 2014. It is worth acknowledging that, despite a 20% increase in the number of appeals that the Tribunal are now processing, there have been no extra resources allocated to the Tribunal and, in fact, the independent SEN Tribunal was initially set up to deal with just 500 appeals a year! Now that we have an idea of the volume and types of appeals that the Tribunal deal with, let’s take a look to some of the Key Changes that have happened recently. The first change is a physical one - the Tribunal moved offices in August 2014. Having been based in Mowden Hall, Darlington since its inception, the Tribunal has now moved to upper floor of Darlington Magistrates Court. The physical space has been reduced from 6,000 sq metres to 3,500 sq metres. This has certainly been a challenge for the Tribunal, but they do appear to have coped well – despite having lost almost half the space, they have lost none of the staff! Everything has been condensed in what seems to be an attempt to simplify the process and provide more clarity for users. But actually it seems that things have been over-simplified and there have been a number complaints about inaccuracies on the website. Overall there has not been a good experience of the site so far, but the Tribunal Administration are very aware of this and are working on it. In May 2014 Deputy Chamber President Judge John Aitken was appointed Chamber President of the Social Entitlement Chamber – he moved in early June. Judge Meleri Tudur replaced him and is now the Deputy Chamber President of the Health, Education and Social Care Chamber; First-tier Tribunal. Jane McConnell, the Current Chief Executive of the charity, IPSEA (Independent Parents for Special Educational Advice) will replace Judge Tudur as Judicial Lead in June 2015. In an almost symbolic divide between the old and the new, the administration of the new system will be completely digital, instead of paper based! All EHC appeals will be run digitally by the Tribunal – no paper files will be retained by the administrative office. In keeping with this change, the Tribunal would now prefer as much to be sent in via email as possible. This pilot ran from 2012 to September 2014 and looked into the effectiveness of providing information to parents on mediation in SEN appeals. 8 LAs in the south east of England got involved and encouraged parents to seek mediation information from independent mediation providers within 2 weeks of the registration of their appeal. The result was that the number of parents accessing this information increased from very low (almost negligible) to 25%. As a result of this success, the principle was incorporated into the new framework, so under the Children & Families Act 2014 a Mediation Certificate is now required (to show parents have accessed mediation information from an independent provider) before an appeal can be registered (this can be found in the Code of Practice 2015 at para. 11.18). Whilst this might seem like just another administrative hurdle for parents to have to get over if mediation isn’t a realistic option, if approached strategically this can be used to parent’s advantage. The parents’ time for making appeal (the 2 month window) can be extended to one month from the date of the certificate, if that post-dates the 2 month window for making the appeal. This can be useful if, for example, you are waiting for an expert assessment/report as this extra month will allow you to submit it with your initial appeal. Of course this is only an advantage if the parents know about the requirement and also about the potential extension. Unfortunately though, lots of appeals are having to be sent back as parents have been failing to include the certificate. Bundles must be produced according to strict deadlines prior to the hearing and Judge Meleri Tudur has expressed that the Tribunal are being very strict with these deadlines to ensure that the overriding objective of dealing with appeals justly and fairly is met. LAs are already being barred from hearings for not complying with these deadlines. Judge Tudur has been clear that it is vital that everyone gets sufficient time to familiarise themselves with the bundle before the hearing – particularly parents who are not used to dealing with so much written information/Judges who work part-time alongside another job. Guidance is being produced for LAs to prescribe eaxctly how the bundles should be presented (there is currently draft guidance available). For many people (mostly LAs), this development had come as a complete surprise or rather a shock and a number of LAs have only found out about it within the last month. The deadline for transferring the Statements of young people transferring to Post-16 education this year is 31 May 2015 (and thereafter 31 March). The 7 week timetable has been phased in starting with this year’s Post-16 appeals, but actually the Tribunal have wanted to shorten the length of appeals for some time and again they have seized the opportunity with the new framework. The Tribunal are also offering parties the opportunity to request a hearing during August, when traditionally the Tribunal has not been sitting. The overall intention is that, by doing this, the YP will know what their placement will be for the next academic year as early as possible. Secondary Transfer appeals are already automatically expedited to a 12 week timetable – this has not changed. Between February and July 2014 there were 468 Secondary Transfer appeals registered and none of these had to be postponed, so the Tribunal now has a good track record for expedited appeals. Further evidence for these appeals is required at Week 8. It is also worth noting that actually any appeal can be expedited if requested by the parties. All that needs to be done is to agree a date between the LA and parents and Tribunal have said that they are happy to accommodate this. Between October 2013 and April 2014 – all refusal to assess appeals were heard by 2 person panels (instead of the usual make up of 1 legally trained judge and 2 specialist members - as was required by the First-tier Tribunal and Upper Tribunal (Composition of Tribunals) Order 2008). - Just 69 of these appeals went to hearing (around 11%). - Of these 69 appeals, 30% of these were decided in favour of the appellant. - The number of LA decisions upheld was 32. - 6 of the appeals were adjourned. - 1 appeal was withdrawn at the hearing. So the upshot of this was that 2 person panels are now ‘business as usual’ for all refusal to assess appeals! This is subject to judicial discretion which allows for judges to request a 3rd panel member if the case is complex. Currently, this only applies to appeals under the old framework - so 3 person panels will remain for all EHC appeals, whilst everyone gets to grips with the new law. It is important to note that the test for complexity of the case is not a test of the complexity of the child’s needs, but the complexity of the issues in the appeal. There are currently plans underway to extend Tribunal’s power, to enable them to make non-binding recommendations as to the health and social care needs and provision in EHCPs. This has been brought in under S.79 C+FA – which sets out an obligation on the Secretary of State for Education to carry out reviews of the effective review mechanisms for disagreements. Under this pilot, an additional panel member will be required with expertise in social care and/or health provision. The intention is to make the Tribunal a ‘one-stop shop’ for all aspects of the EHCP. The pilot will run for at least 12 months, starting 1 May 2015. 13 LAs and health bodies will be participating in this and the onus will be on LAs to keep other providers involved and aware of the changes. After the recommendations are made by the Tribunal, there are 5 weeks for the health and social care bodies to respond, after which the parties will decide whether they need to come back to the Tribunal. There are 32 staff (28 are full-time/4 are part-time). They are split into 3 teams: the Admin and Registrations Team, the Processing Team and the Notice of Hearing and Listings Team. NB: the staff used to be split into teams based on geographical areas, but now they are split into tasks. So to link this back to our figures, these 32 staff now deal with over 4,000 appeals a year! There are 4 people working in the admin office and they are always working on oldest piece of work. In fact all working is done on a date basis throughout administration – everything is structured based on this. There has been some confusion with new appeals in relation to Mediation Certificates. The Tribunal are having to send lots of appeals back due to not having these. It has been noted that the .gov.uk website has not done much to help this issue. There are 10 staff – 4 are part-time. The team is split into tasks: queries, late requests, issuing orders. Late evidence gets passed onto a Registrar – who will either accept it or not and then an order will be made and, if the evidence is not accepted, a letter will be sent to the party returning the documents. The average time it takes for an order to be issued is 35 minutes. Registrars can deal with Requests for Changes, but it will depend on the request – Registrars have a list of delegated powers and some things will be outside of their remit. Registrars are typically legal advisors from the family courts. When things need to go to a Judge or even to Registrars, this can cause delays, if those people are not nearby as the documents have to be sent to them. But...now that everything is electronic, this process should be sped up as it will now be much easier for a Judge to access documents e.g. if they are at another hearing in London. There are 3 people that work on this team. 2 of them work full time and 1 works part time on decisions. They deal with listings, venues and Panels. So they have had to process any 3rd Panel members requested under the old pilot for refusals to assess and now for appeals against Parts 2, 3 & 4 of a Statement. Practically, the team gets calenders in from all the Judges and Panel members and then allocates hearings to the Panel members. Hearings are then continuously reallocated as things change/cases get withdrawn. The only permanent venue is Pocock Street in London, where there are just three rooms, although, they do have spaces for some dates in the year in Winchester, Manchester and Loughborough. But all others venues are obtained through casual hire. Because of the huge amount of appeals that are withdrawn, the team over-list in the 3 Pocock street rooms to avoid wasting these spaces and they actually list as many as 12 on one day, although can only fit three! One man is largely responsible for physically working the photocopier and collating all of the bundles. - The biggest bundle they have ever processed was 2,441 pages long…and the case was dropped a few days before the hearing! This will eventually be phased out as LAs have now taken over responsibility for the bundles. Unlike the Tribunal Administration though, if the deadline to provide bundle is missed by the LA, they will be automatically barred from the hearing and they are then given five days to explain why the deadline has been missed. As mentioned previously, the new legal framework was a chance for the Tribunal to go electronic and so all EHC appeals are now going to be run digitally. An electronic system has been set up with the same structure as the paper based appeal filing system to avoid confusion for the staff. But now with the electronic system, there is the benefit of a shared drive. This is backed daily up so there should no longer be any lost documents. This can also be accessed remotely - which means Registrars/Judges can deal with matters wherever they are e.g. in Pocock Street. So, if a hearing finishes early, they are able to deal with paperwork straight away. This will also save space in what is now a much smaller office. It will also save time on calls, as staff will no longer have to go and hunt for the physical file! The Workforce Management System (WMS) is a system used by the Tribunal which calculates how much work is coming in and which staff members will be allocated to do it. Work is organised according to the oldest piece on the system. They have calculated that they will save 7 hours of work per week using this system. Currently, there has been an increase in the incoming pieces of work which require a Registrar/judicial intervention and staff have been dealing with more and more urgent matters, which has led to delays in the 10 working day turn around to deal with requests. As of 31 March 2015 though, they are back to the 10 day turn around. This has been instilled as a sort of mantra for all of the administrative staff. It means that they are always looking for a better way to do things and are always trying to reduce waste, by aiming to be quicker and more efficient. An illustration of this is their ideas board where staff stick light bulbs up throughout the day with new ideas for improvement. The Tribunal Administration value feedback greatly. They send out lots of survey links on auto emails. An annual survey is taken in January/February of each year. They also hold user groups every 6 months amd this has now increased to every 3-4 months with the implementation of the new framework. They are hoping to shortly start publishing a customer newsletter to provide users with more information on the Tribunal processes and any changes that are afoot. They want to publish customer satisfaction survey results. They are looking into a text messaging option for deadlines – to act as reminders. They are also looking at a Webchat facility – to allow users to put questions to the Tribunal. They are looking into LAs sending hearing bundles electronically. Do not use plastic folders/ring binders - these are recycled where possible but most often thrown away! Everything must be single sided. Do not use paperclips - just keep together with an elastic band. Much now comes in by fax and email now and with the new electronic system, everything has to be scanned anyway, so the Tribunal would like as much as possible to come in by email. To help with getting your appeal registered your should state clearly what you are appealing for and why you are appealing. The Tribunal now accept a typed name as an e-signature – so you only need to sign documents if your are sending hard copies by post. As discussed, for EHC appeals you must have Mediation Certificate – if not your appeal cannot be registered and will be sent back. The 2 letters are followed directly by 3 numbers, which are unique to the Local Authority (e.g. Blank City Council's number is always 123). The second 2 numbers relate to the year the appeal is lodged during. The last 5 numbers relate to the number of appeals registered against that LA so far during the year it is lodged. It is always better/quicker to seek other sides views before making request for any kind of change in the appeal, as it saves the Tribunal time in having to seek the other side’s views themselves. If you are responding to an LA/parent’s request for changes – you should put it in the subject of the email and it will be prioritised by the admin team. Try to get all your evidence in the first bundle as far as this is possible. If you are sending multiple emails about the same issue, number them, otherwise they will be put into time order. Ensure that the quality of the copies sent in is reasonable so that they can be scanned, this can be helped if you print in greyscale or shrink PDFs that you send in. Attendance Forms are better when typed. If any there are any changes, you should send in another Attendance Form. All of the staff seemed very dedicated and engaged with the process – they had a real sense of what the process was there to achieve. They were completely transparent about the inner workings of the administration. They are a very small team with a significant workload. As a result of the move in August, they are in less than ideal premises. What came across most strongly was the genuine commitment to ‘Continuous Improvement’. She was confident that her panels knew what should be in an EHCP. She noted though that from what she has seen so far, the contents of plans have varied widely and that some LAs do not seem to know what goes where. Somewhat controversially, she said that she does not herself think that it has been helpful to broaden the contents and structure of Statements – she felt they worked as they were. She has said firmly that hearings will not be moving to using electronic bundles under her watch as they are too difficult to flick through! She would like to see the Judiciary doing some more active case management. - LA officers can be expected to conduct themselves according to a higher level of conduct. - It is an issue of fairness for all parties – ensuring there is a level playing field. - There are four salaried judges, but the rest are part-time so they have day jobs and so need sufficient time to prepare. - Parents are not usually used to dealing with such a lot of documentation and should be given sufficient time to prepare.